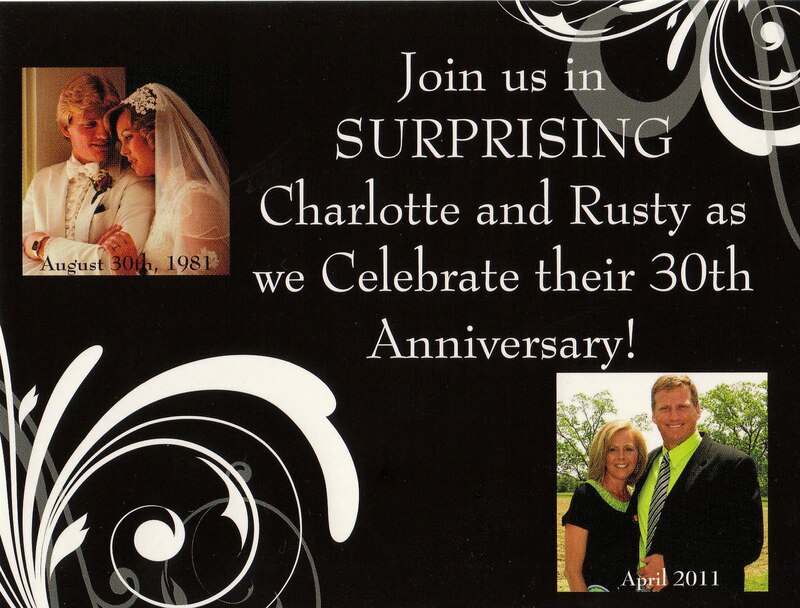 A couple months ago Courtney and Casey approached me about the three of us putting together a party to celebrate Mr. Rusty and Mrs. Charlotte’s 30th wedding anniversary. I know that typically people make a big production out of the 25th and not the 30th…but 5 years ago Brad and Courtney had just gotten married, Zach and I were engaged, Casey was in college and we were ALL broke! Instead of waiting for the 50th, why not celebrate now? 30 years is a HUGE achievement and something worth making a fuss over for sure. Even though we all are doing better financially than we were 5 years ago, we still couldn’t spend a fortune on the event. We decided to have it at my church since I could use the facility for free and it’s where Mr. Rusty and Mrs. Charlotte got married so it’s a special place to them. Since Courtney and Casey are both school teachers and just started the school year, I took on a lot of the planning aspects of the party. It was tough for me because I like to do things all out and we simply didn’t have the funds to do it the way I would have liked to have done it…but I was SO pleasantly surprised with how everything turned out! 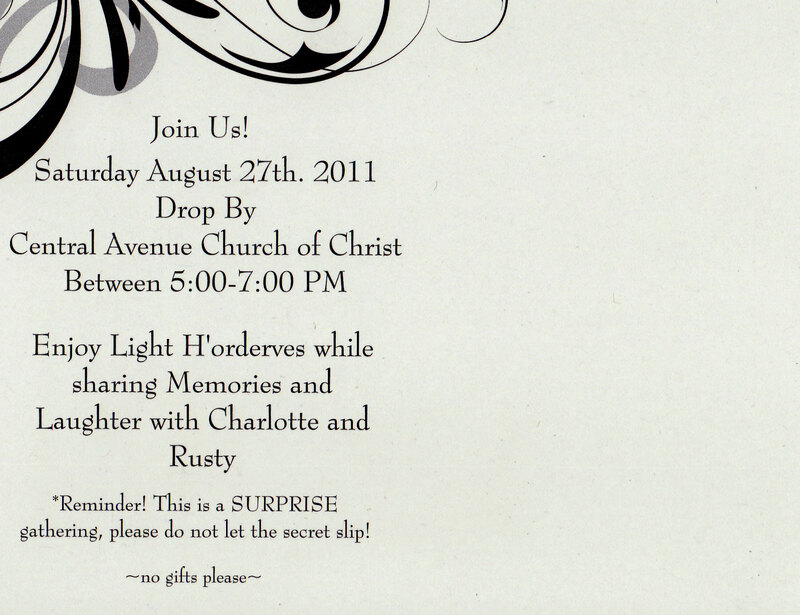 We opted for a postcard invitation as it saved on postage and invitation cost…have you ever used Vistaprint? I’m telling you, they have the BEST deals!!! I made sure to say the word “SURPRISE” twice as we really were hoping everyone would keep the party a secret! Courtney, Casey and I met several times to plan the event and worked hard putting it all together. It was some great excuses for girl time and we had fun during all of our secret planning sessions or shopping excursions 😉 Their actual anniversary was August 30th but we had the party the Saturday prior (the 27th). Even when you have everything ready to go…the day of an event is still so stressful! Thankfully Aunt Karen came up to the church with us and helped us set up. It was my first time ever hosting something at church and I was clueless about where things were, the rules I needed to follow, and how to make the sweet tea! We decided early on that simple would have to be the way to go – we sent out about 100 invitations, which meant around 150 people were invited, and we didn’t do any type of RSVP. We had it be a drop-by type of event so we were really clueless as to how many people would show up, how many centerpieces we needed, or how much food we needed. I actually went to the dollar store and found all the centerpieces for 20 tables and it looked very nice! We gathered up ALL the pictures we could find of Mr. Rusty and Mrs. Charlotte through the years and used them along with candles and stones for the centerpieces. Everyone LOVED the cakes and we got them at Sam’s! We didn’t want the hassle of making everything ourselves so we got some trays catered from Sureste (which were SO GOOD!!!) and bought several things for filler food from Sam’s. Mom even helped and I’m SO glad she made such pretty, healthy dishes. They added a lot of color and texture to the food tables and everyone raved about it all! Mom was a HUGE help! We couldn’t have pulled it off without her for sure! Luke, Kris and kids – cousins of Mr. Rusty’s! As I said earlier, we mailed out a LOT of invites and didn’t do an RSVP so we were pretty much clueless as to who was coming. And since it was a surprise no one really talked about it at all so I was pretty nervous that no one would show up. We were cutting the cake when someone let out a scream and we realized PEPE (Mrs. Charlotte’s dad) and Brenda (his wife) had come!!! It was a HUGE surprise. They live up in South Carolina and haven’t been to visit since Courtney’s wedding 7 years ago. The last time Zach and I saw them was at our wedding and they’ve never even met Kye! I meant SO MUCH to Mrs. Charlotte that her daddy made the effort to be there and it really made the event. Kye liked Pepe right away! You can tell the kids were ready for bed! We were all beyond happy with how great everything turned out. I was pretty nervous with our limited budget how well it would go but it turned out to be awesome! It was great having the three of us work as a team to get it done because we all had each other to lean on and could divide and conquer everything. We ended up staying for awhile after cleaning up and such and it’s totally the day I WAY overdid it…but it was worth it to see Mrs. Charlotte and Mr. Rusty so happy! They are an AMAZING example to us all of how to have a successful marriage. They haven’t had the “perfect” marriage but they work through their problems and strive to be the husband and wife GOD wants them to be. I know personally I’m blessed to have their example for my own marriage and am thankful they raised a son who takes his marriage vows so seriously. I can’t wait till it’s OUR turn for our 30th anniversary!!! Thanks to everyone who stopped by the event and helped make it such a special time for them! Previous Post Kye’s First Day of Preschool!